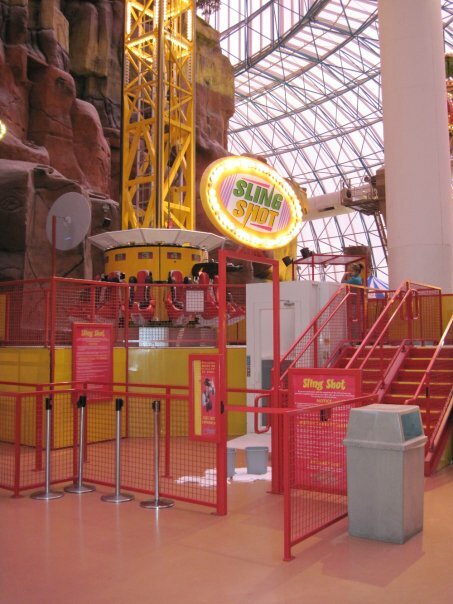 Adventuredome is adjacent to the Circus Circus Hotel at the far north end of the world famous Las Vegas Strip. The interior is meant to evoke a Desert Canyon scene. 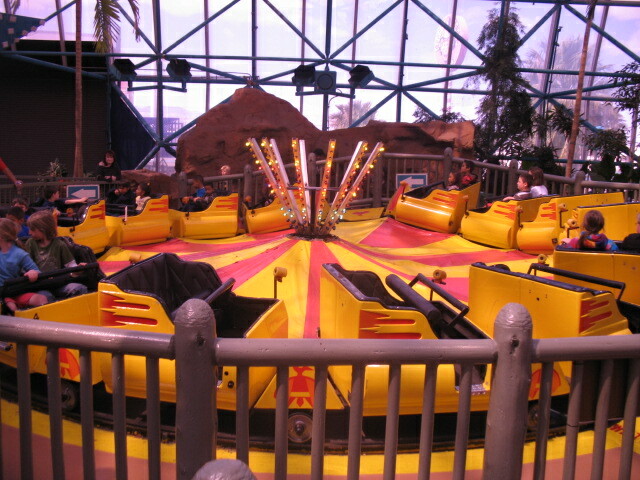 The Canyon Blaster (coaster) and Rim Runner (log flume) are the major rides in the park. Food options are limited but there are plenty of options in the vicinity. In addition to a free clown shoe, right next door in the Circus Circus Casino you can enjoy free circus performers. Certainly worth a visit if you are in the area especially if with children. The Adventuredome lacks in rides and really only takes a few hours to complete. 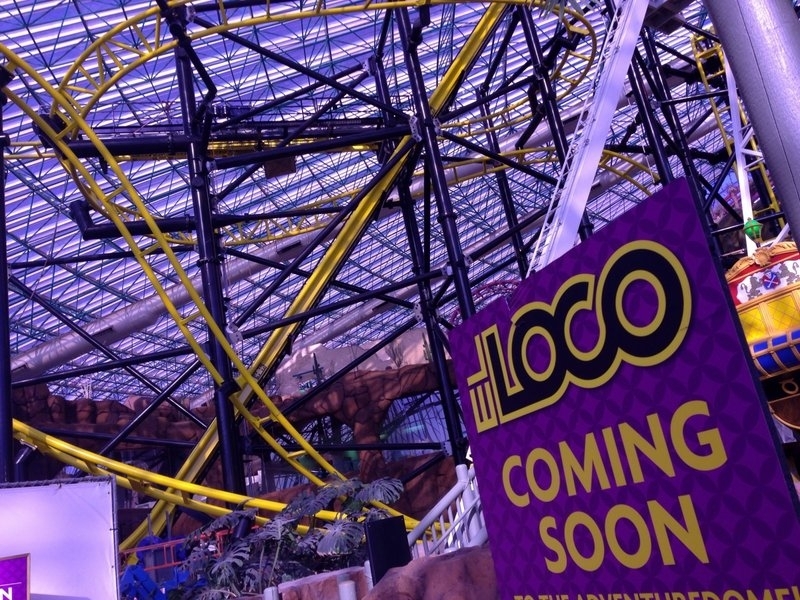 Though, El Loco is a great coaster and has ejector airtime on the first drop. The problem is that El Loco and Chaos are the two only really good rides in the park and the operations are OK. It is worth visiting if you are in the area. Being built inside a tinted dome makes this park a pretty unique experience. Unfortunately, the place is rather shabby looking, and overrun with unsupervised children. Canyon Blaster is actually a pretty good coaster; it has a few surprises and isn't terribly rough. Operations leave a lot to be desired. Overall it was an interesting experience for me, but not one I'm in any rush to repeat. Adventuredome is ok for about a two hour visit, which may be alright since the admission is free. If you are already in Vegas, it's worth popping in, but don't expect to be there for long. Seemingly used more as a babysitting service for teens while their parents go gamble, the crowds can be pretty annoying for adults. The park's coaster and various flat rides are generally unimpressive. It appears the MGM would rather have busted games and attractions sitting around versus repairing them or removing them. This greatly reduces its appeal, but it is Circus Circus. Canyon Blaster is a fun surprise and the Mego Disk-O is run on insane. You will get wet on the splash boats. This was an interesting park. Although not much to do there, and a limited food selection we still enjoyed our selves. The looping coaster was okay and definetly pretty good because there were barely any lines. The same goes for the water ride. No one was riding the ride. The drop ride was just your average drop ride with very long loading times. Overall this park was okay, but for the price for an all day ride pass its a definite hit if your in vegas! AdventureDome is a good little park in Vegas. It has a decent selection of flat rides. It also has a decent (yet bumpy) Arrow coaster (duh). It's good for families that aren't coaster enthusiasts (as the rides are only OKAY). The biggest complaint is that it is always PACKED! Since they don't offer any sort of virtual queue, lines can and will be hectic! Now that the Sahara and, consequently, the Speed coaster have closed down, this is my one must-go-to park on the strip. I LOVE the amount of air you get on the Canyon Blaster coaster in the front seat, and the whip-like pull you feel in the back seat from the first drop. It's a very surprising little coaster. As far as the rest of the park, it has a great atmosphere, lots of attractions for kids and teens, and, most importantly, is air-conditioned!! It does get a little warm at the top of the lift for Canyon Blaster, but you'll be whipping around the course soon enough to forget about it! 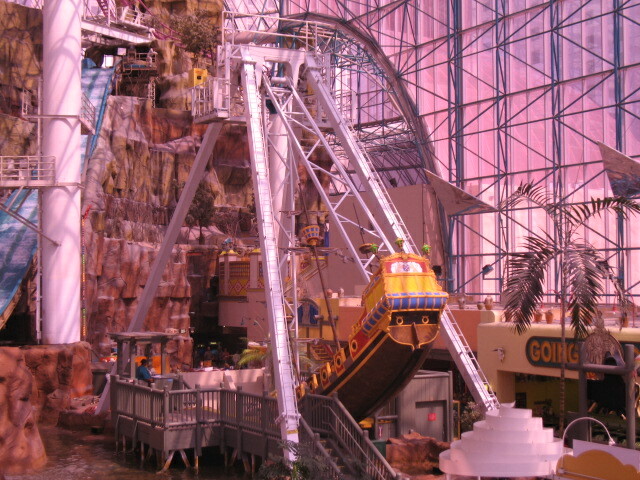 The Adventuredome is the only true amusement park in Nevada, and it is small. The park will only keep the average person occupied for a couple hours. Other than Canyon Blaster and Rim Runner, the parks' attractions are very generic. If you go on a weekday, crowds shouldn't be an issue, but the same can't always be said for weekends. 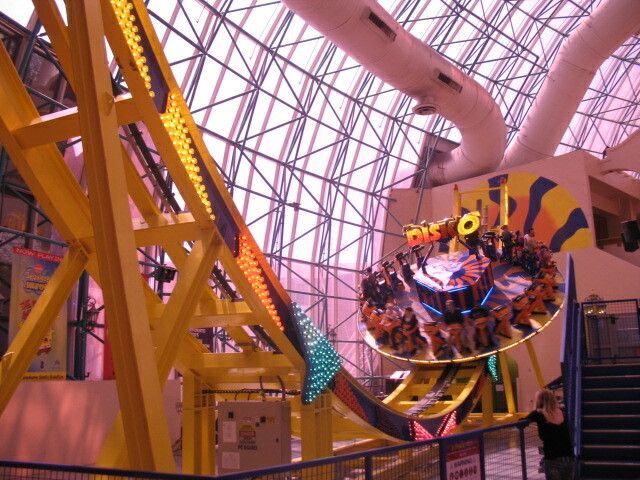 Adventuredome is the most "park-like" of any resort with a roller coaster in Vegas. 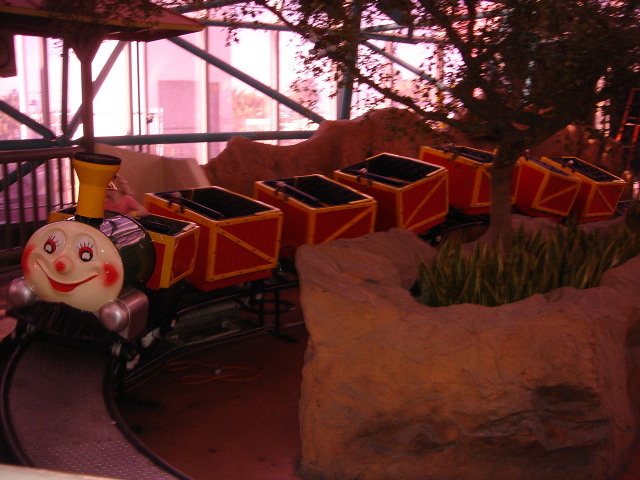 During my visit, most of the rides had a minimum of a 15 minute wait. I would suggest allowing an hour or two to spend at this park. 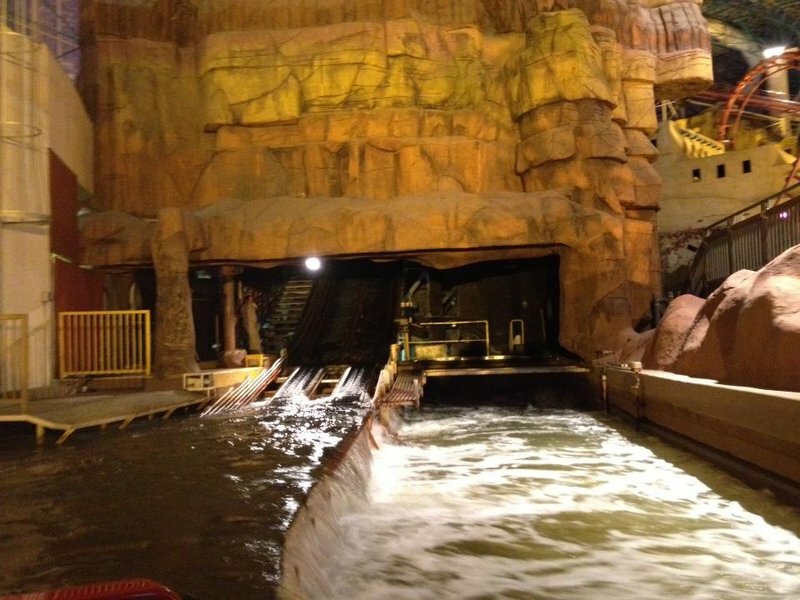 Canyon Blaster is a fun ride, but is not the biggest/ most intense coaster in Vegas. I find the Adventuredome to be quite a fun place, and a great respite from the Vegas heat. While it may seem like the kind of place to simply get the credit (which, for an Arrow Corkscrew, is quite good), there are a number of fun and intense rides for the entire family to make day-long wristbands more than worth it! I've been coming here for 16 years and have enjoyed every single visit! Fun little park to visit in your spare time while in Las Vegas. Watch out for rainy days because the roof leaks pretty bad and if you're under age they do enforce a curfew. 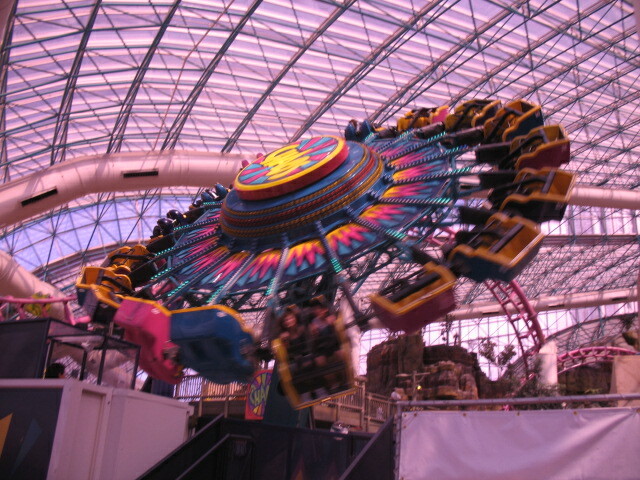 The Adventuredome for me is a great way to beat the heat, and enjoy a decent ride without the heat. Staff is mostly friendly and well manored- and they're pretty good about keeping things running right. The Dome is IMMACULATE- and is kept at 72 degrees year round, perfect for a hot summer day in Las Vegas. I liked this place a lot, and have lots of memories here, they seem to keep it clean and up to par. Just stay away during those holiday weekends! It gets overcrowded. This place is amazing when you have a couple drinks in you. Not enough to make you sick but enough to have a better time than when sober. They do have a quality ride line-up and Canyon Blaster ain't too shabby. Although if you really want a roller coaster experience on the strip then take a trek down to the Sahara. It's a nice escape from the Vegas scenery, but don't expect too much. The coaster is pretty old and rough as well. Some of the flats are good, but there are not enough attractions.